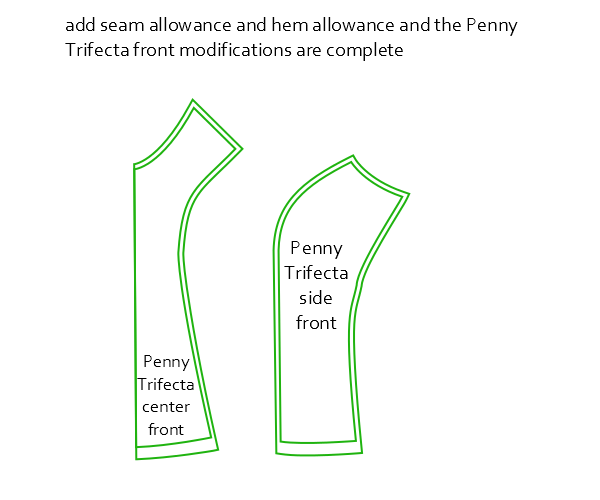 In order for you to make your own Penny Trifecta MashUp, today I’ll show you the alterations I made to the pattern pieces. 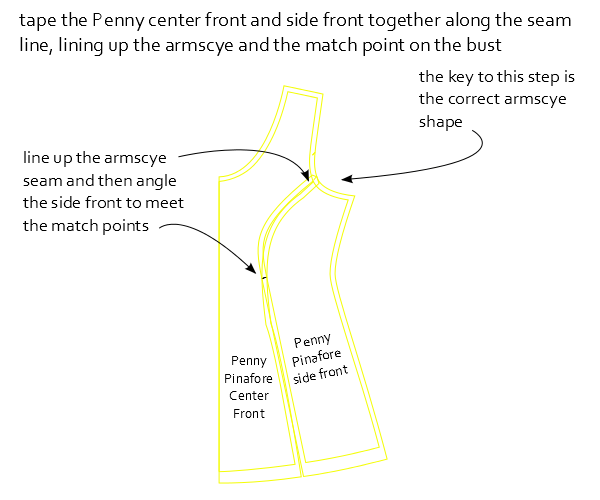 As always, these drawings are not exact nor are they to scale so please refer to the actual Penny Pinafore and Trifecta Top pdf patterns for the orginal pieces. 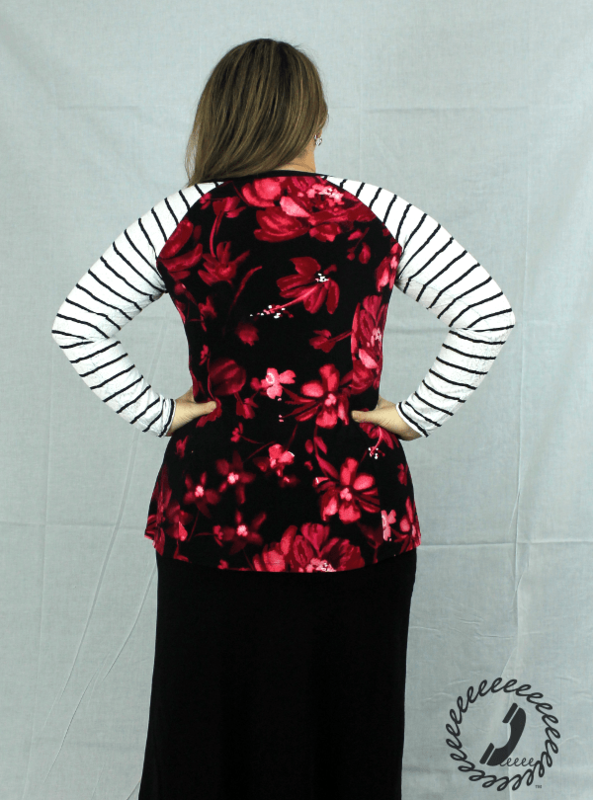 I knew when I started the MashUp that I wanted to use the v-neck and the raglan sleeves from the Trifecta Top and the princess seam shaping from the Penny Pinafore. The neckline modification was relatively easy, but things got a little trickier when adding the raglan sleeve to the Penny bodice. 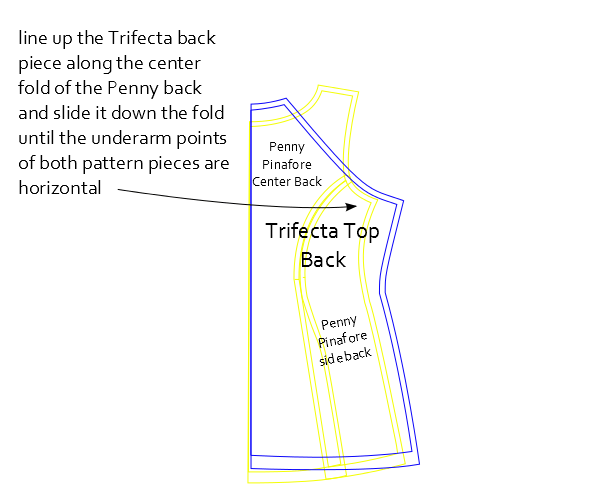 To begin, trace the Trifecta Top back and front pieces in the size that fits you best. 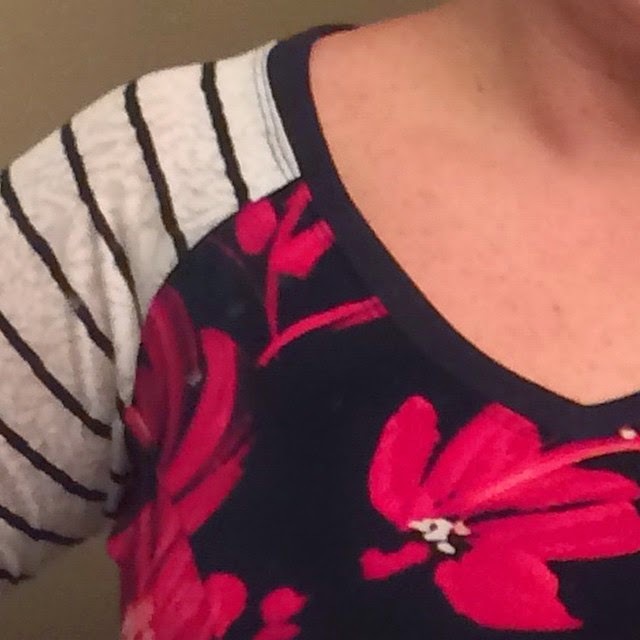 I used the v-neckline for the front piece, but you could use any of the options. Mark the seam allowances on each of the pattern pieces as well. 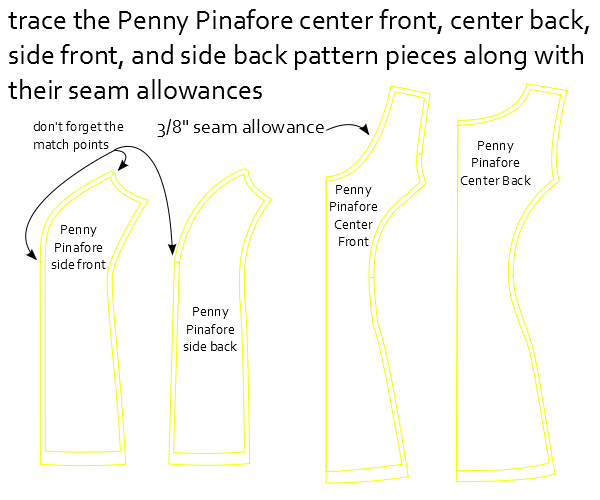 You’ll also need to trace the Penny Pinafore center front, center back, side front, and side back pieces in your correct size and whichever length you’d like. I chose the tunic length. Be sure to trace the match points as well. Mark the seam allowances and note that Kitschy Coo uses 3/8″ seam allowance for both patterns which makes things easier later on. 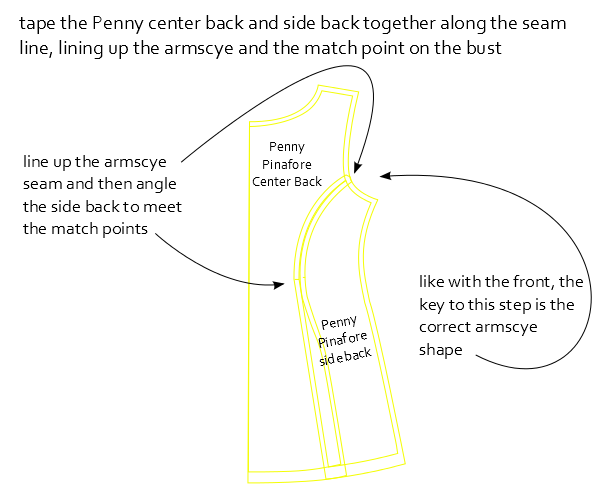 Using the match points at the bust and the armscye seam allowance, temporarily tape the Penny side front pattern piece to the Penny center front piece along the seam line creating the full front armscye shape. Because of the curve, the entire seam won’t want to lay flat for tracing and we’re only concerned with the correct shape in the upper bodice and armscye at this point, so don’t worry about taping the seam together past the bust match point. Now take the Trifecta front piece and lay it on top of the Penny full front, lining up the center fold and sliding the Trifecta front along the fold until the under arm seams are about even. The raglan sleeve is a bit looser than the Penny underarm so there is a little leeway there. 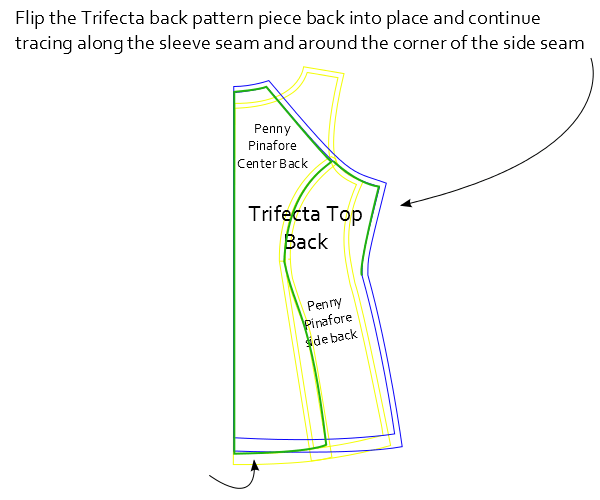 Trace the v-neck of the Trifecta up to the start of the sleeve and down the sleeve seam to the end of the seam allowance of the center front piece. 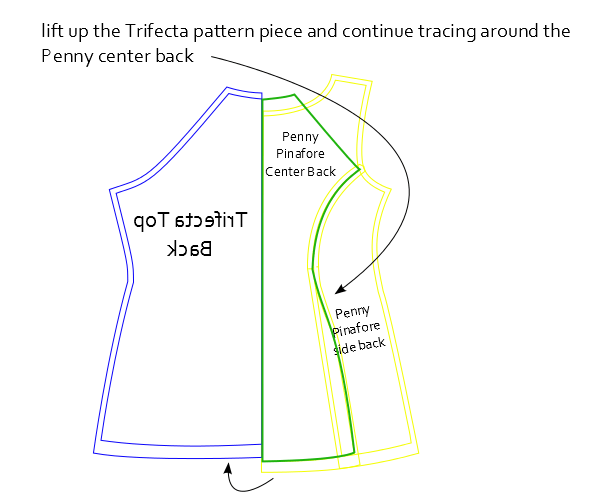 At this point I lifted up the Trifecta pattern and continued tracing the rest of the Penny center front pattern piece. 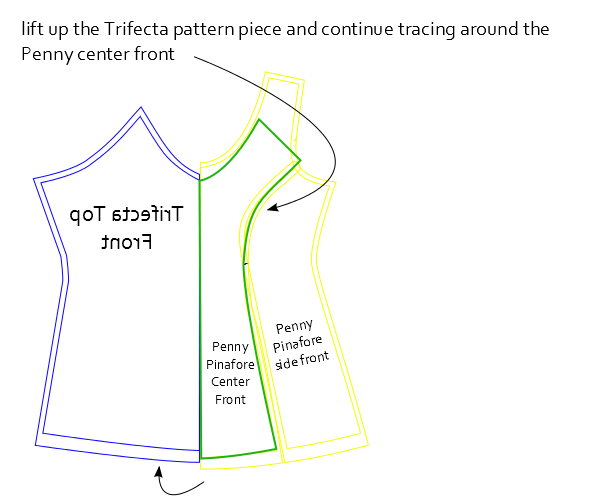 Taking a new piece of tracing paper and putting the Trifecta front piece back into position on top of the full front Penny pieces, continue down the sleeve of the Trifecta and round the corner down the side seam. 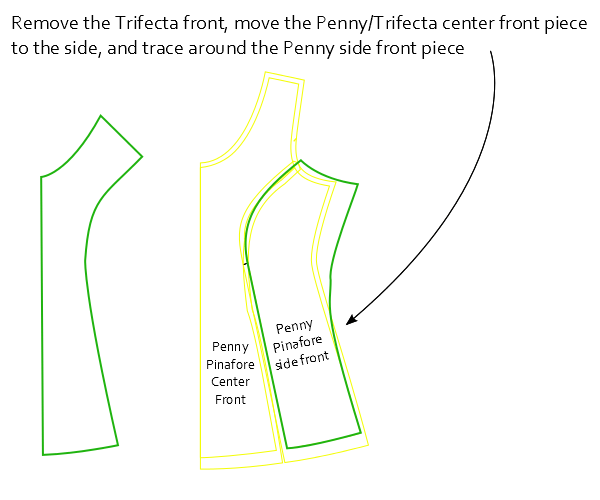 Remove the Trifecta pattern and the Penny/Trifecta center front and continue tracing the rest of the Penny side front piece. You should now have a center front Penny/Trifecta piece and a side front Penny Trifecta piece. Add the seam allowances and the front modifications are complete! For the back we’re going to do the same thing we did for the front. Along the seam allowance, tape the Penny center back and side back pieces together to the match points. 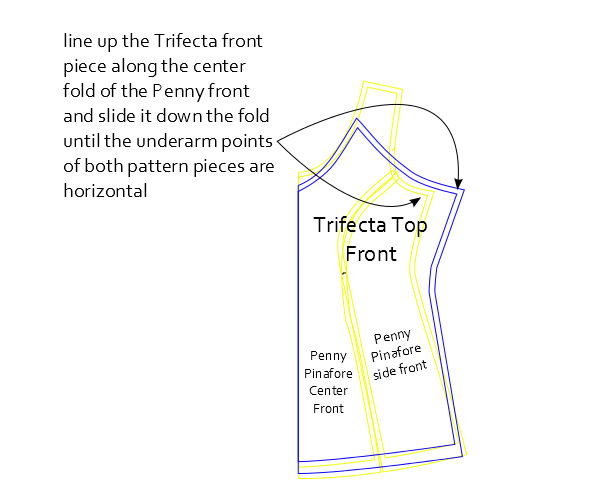 Lay the Trifecta back pattern piece on top of the Penny full back, lining up along the center fold and adjusting until the underarm seam is in the right position. 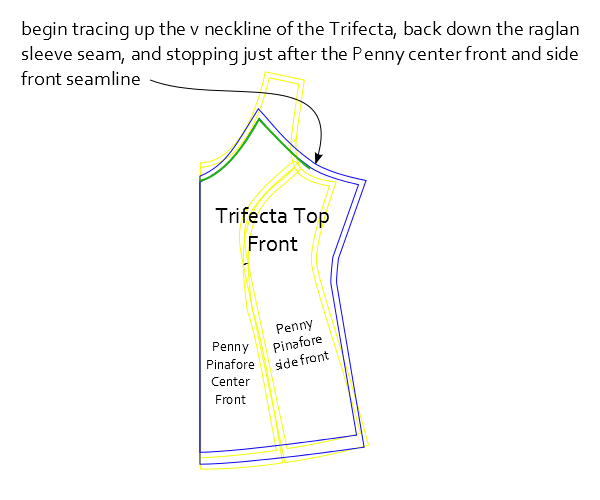 Trace along the neck of the Trifecta up to the start of the sleeve and down the sleeve seam to the end of the seam allowance of the center back piece. 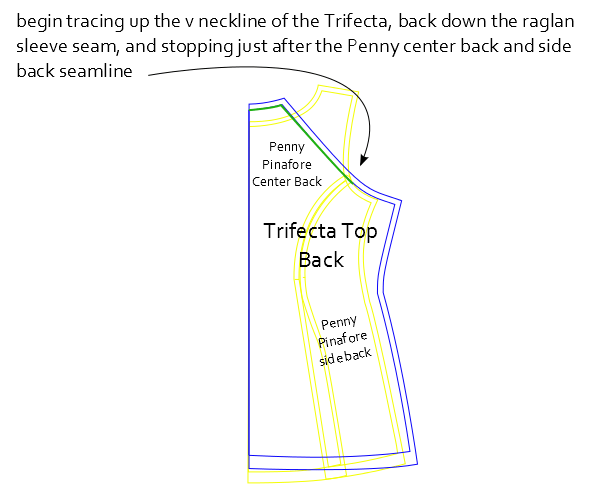 Lift up the Trifecta pattern and continued tracing the rest of the Penny center back pattern piece. 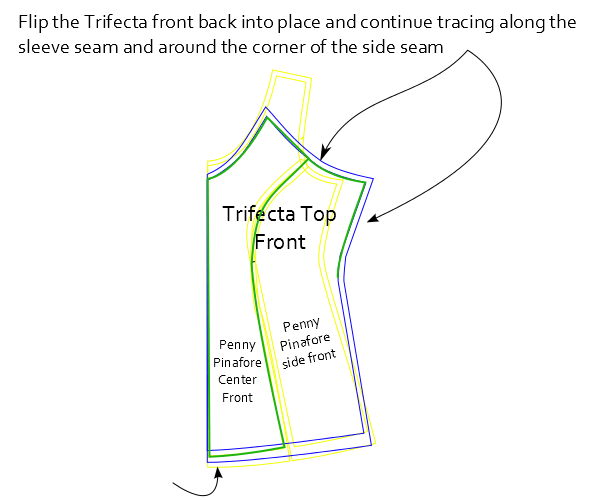 Taking a new piece of tracing paper and putting the Trifecta back piece back into position on top of the full back Penny pieces, continue down the sleeve of the Trifecta and round the corner down the side seam. 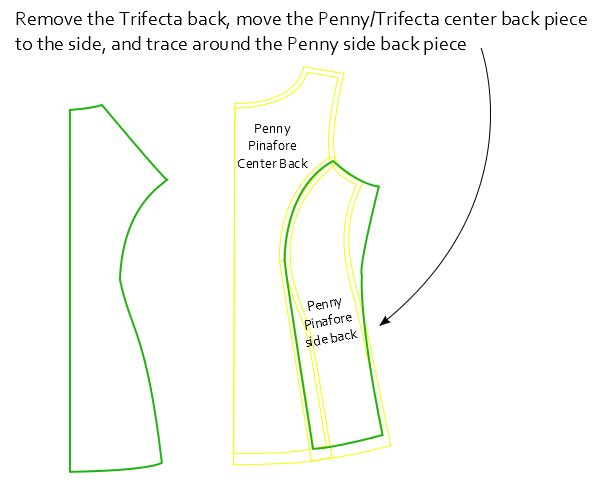 Remove the Trifecta pattern, set the new Penny Trifecta center back piece aside, and continue tracing the rest of the Penny side back piece. You should now have a center back Penny/Trifecta piece and a side back Penny Trifecta piece. Add seam and hem allowances and all of your alterations are now complete! 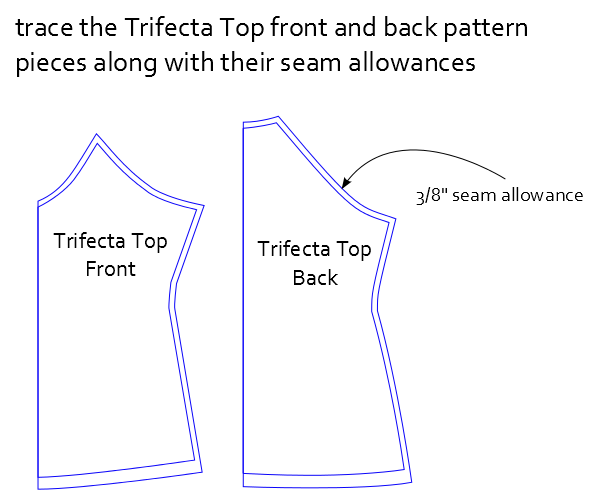 You can now use the Trifecta v-neck band and you can use any of the Trifecta sleeves with the Penny Pinafore shaping. 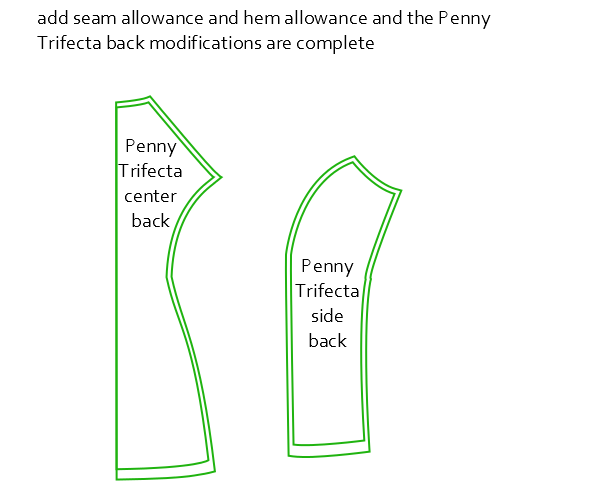 To sew the Penny Trifecta MashUp follow the Penny instructions for attaching the side fronts and side backs to the centers and then use the Trifecta pattern instructions to complete the neckline sleeves, and side seams. Use the Penny Pinafore hemming instructions and your mashUp is complete. 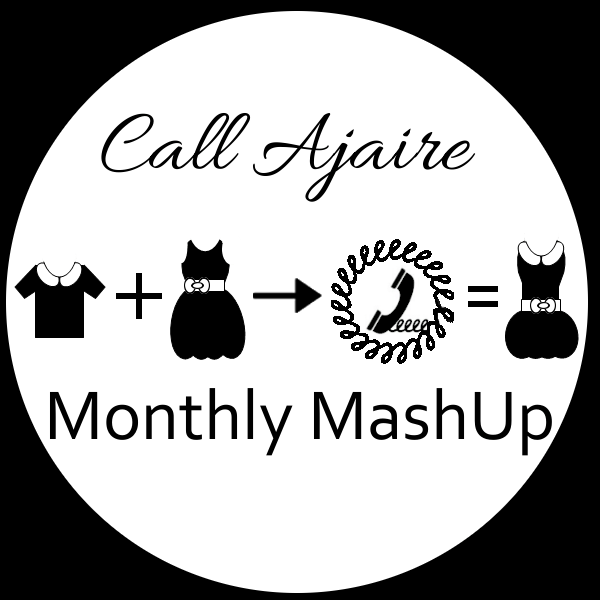 There is still time to add your mashUp to the link up! Join the facebook group and feel free to ask any mashUp questions you have in our comfortable group environment.